Pain & Gain is based on a true story and it involves three bodybuilders (Mark Wahlberg, Dwayne “The Rock” Johnson and Anthony Mackie) at various stages in their lives, trying to achieve the American dream any way they can. Things predictably go horribly wrong for them after they kidnap a wealthy dirtbag businessman (Tony Shaloub) in an attempt to steal all of his assets. That last sentence is probably an understatement as this movie gets so crazy that by the end of it I was questioning how “true” it really was. I will start off by saying that I really liked this film and I actually would put it 4th in Bay’s filmography, behind Bad Boys II, The Rock, and the original Bad Boys, in that order. It was still a very frustrating movie though and mainly because it is so up and down. There are moments that are absolutely brilliant (mainly involving The Rock) and moments of sheer stupidity with huge plot holes and failed attempts at humor. The pacing was all over the place and it is a very bloated movie. As with most of Bay’s films it feels like there is a better cut of this movie had they trimmed it by a half hour. always liked The Rock and in a fair and just world he would be on the same level as Schwarzenegger when he was in his prime.) Here, he is playing a character that I never would have guessed him playing before this film and I am not sure who picked him out for the role but whoever did is a genius. He completely steals almost every scene he is in and gives a really good performance on multiple levels. He is only getting better. Besides The Rock, all of the other acting was pretty good and the chemistry Wahlberg, The Rock, and Mackie had was terrific and very believable that these guys would get themselves into this mess together. If they didn’t work as a trio, the movie would have fallen apart at the seams and it would have been a fatal flaw. Tony Shaloub was also really good, hamming it up as a sleazy and shrewd businessman and seemed to be having a lot of fun with this role. It was really weird though to watch this film and not to have huge elaborate set pieces. Most of the action was scaled down but really brutal and at times hard to watch. I enjoyed this style because it seemed like Bay knew exactly the kind of film he wanted to make and he made it with no apologies or hesitation. The extreme violence does shift the tone a lot though so if you don’t enjoy films with big tonal shifts then you probably will hate this. The other problem for most people is going to be that there really is not a protagonist in the film. Not at all, because all of the main characters are horrible, horrible people that continue to make stupid mistakes and have no regard for anybody but themselves. I don’t mind a cinematic story that doesn’t have anybody to really root for and in fact in Pain & Gain it felt refreshing and interesting. If you need a protagonist to root for though to enjoy a story then this probably isn’t going to be a film for you. Overall, I would recommend this movie to anybody who liked either one of the Bad Boys films (especially the first one). Don’t be discouraged by the last few films Michael Bay has made because Pain & Gain seems like it was a passion project for him and a big step forward for him. Everyone one else involved with it seemed to be having a lot of fun making it. 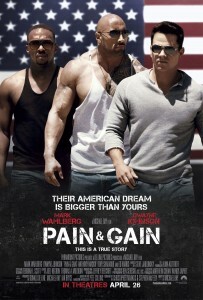 Pain & Gain is a crazy, intense, over the top, funny film and it being interesting is enough to distinguish Pain & Gain from most films that are currently in release.